The success of radiotherapy as a treatment modality is intimately related to the ability to accurately define, plan and deliver radiation treatment to the tumour whilst limiting dose to normal tissue. The confluence of technological advances in both imaging techniques and the way radiotherapy is being delivered has fostered even closer relationships between radiologists, radiation oncologists (RO), radiation therapists (RT), and radiation oncology medical physicists (ROMP). At the same time, the capital and human resource costs associated with these advances challenges the management of modern radiotherapy centres. 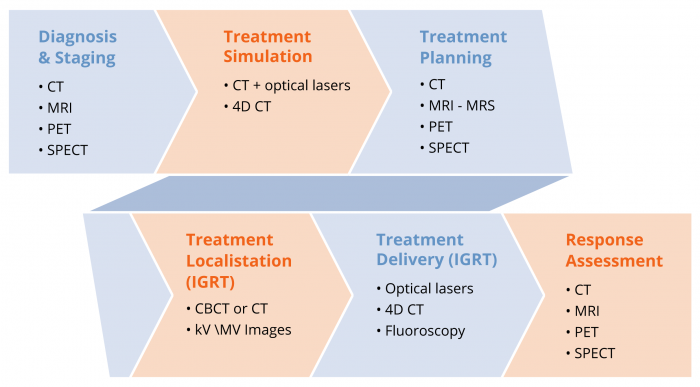 Advances in imaging technologies have supported improved treatment delivery and the development of new techniques in radiation oncology such as stereotactic body radiotherapy. Increased accuracy has led to improved tumour control rates and a reduction in treatment-related toxicities with resultant improved quality of life for cancer patients. The increasing use and complexity throughout the best practice radiotherapy process is demonstrated in the figure above. There is now a large body of evidence showing that more accurate staging in cancer is associated with better patient selection onto treatment pathways. The imaging used for diagnosing and staging the disease should have quantitative capabilities allowing for longitudinal studies to be performed. During treatment and for follow up on completion of treatment, the quantitative capability of the imaging system must be verifiable and maintained to allow accurate and precise evaluation of treatment outcomes in a quantitative manner. This requires the imaging systems to be adequately calibrated and maintained which requires consultation with Diagnostic Imaging Medical Physicists. The increasing reliance of complex imaging systems is increasing the interaction and collaboration between diagnostic imaging and radiation oncology modalities. Computed tomography (CT) scans acquired in the radiotherapy treatment position before the start of radiotherapy remain the basic imaging modality for contouring tumour target volumes and defining dose-limiting normal body structures known as “organs at risk”. A CT scan is mandatory for accurate calculation of dose using a treatment planning computer. 4D CT can be utilised to capture the motion of the tumour volume and the surrounding organs at risk to allow for dose escalation and dose hypo fractionation. Tumour motion can also be managed or reduced, for example, by using respiratory gating technology to deliver the treatment only at a certain phase of the breathing cycle. This enables improved tumour control and reduction in the toxicity from treatment. Advances in the software, computing power and data storage capabilities of treatment planning systems have enabled multiple image sets to be overlayed or “fused” with the planning CT scan to further improve accuracy of delineation of tumour and normal tissue. There is reasonable evidence from lung, oesophageal and head and neck cancers that fusion of PET images to the planning CT can result in significant changes to the target volumes delineated. The problem of motion of tumour volumes within organs as well as adjacent healthy organs, for example motion of the prostate due to bladder and rectal filling and of lung tumour movement within the breathing cycle, has been addressed by the implementation of image-guided radiotherapy (IGRT). Whereas previously only bony structures could be visualized on the treatment couch of the linear accelerator at the time of each radiotherapy fraction, the integration of computed tomography into linear accelerator technology (“cone-beam CT”) as well as the option to introduce radio-opaque fiducial markers into tumours, such as the prostate, made possible the correction of the patient position based on this information at each treatment session. This same principle of IGRT is used in delivery of brachytherapy of gynaecological cancers where MRI is used; as well in high-dose rate brachytherapy of prostate cancer where implanted fiducial markers are used. This not only ensures that the tumour volume is being treated accurately each day but gives the potential to reduce ‘error margins’ in radiotherapy delivery thereby significantly reducing side effects of treatment. A good understanding of the dosimetric impact of the increased imaging requires access to Diagnostic Imaging Medical Physics expertise. If daily cone beam CT imaging is used, then a significant proportion of the radiation dose could be delivered by the imaging system requiring the two sources of radiation dose to be combined for planning purposes. This challenge is yet to be faced in most centres, however it will become increasingly important that the diagnostic imaging modalities used during treatment are well understood. Extremely precise delivery of high radiation doses to small volumes was already technically possible in the 1990s but this was limited to intracranial stereotactic radiotherapy (“radiosurgery”). The brain is ideal for this procedure, as tumour or organ motion is practically non-existent within the bony cranium. However, with the ability to accurately image patients while lying in the treatment position on the linear accelerator, new ablative treatments have become available for treating extracranial sites, particularly in the lung, liver and spine. Although these procedures have only recently become available the emerging literature suggests that they are more efficacious and well tolerated compared to previous ‘non-stereotactic’ treatments. These new evolving techniques depend on a combination of immobilisation devices integral to the linear accelerators and on-board, in treatment room, real-time imaging that allow for online correction of minute displacements of the target from the idealised treatment position. This technology has started to become available in the modern radiotherapy department with sophisticated equipment that requires additional investment in capital and human resources. The actual delivery of such complex treatment that requires additional quality assurance steps, and time, also impacts on the throughput of patients within a radiotherapy department. These new techniques of treatment allow an additional spectrum of patients to be referred for radiotherapy; including those who are considered inoperable and otherwise would be considered “untreatable”. These non-invasive techniques enhance the armamentarium of the radiation oncologist and offer additional hope to such patients. After receiving radiotherapy, particularly for radical (curative) radiotherapy it is important to be able to decide if a patient is in remission or if there is still evidence of active disease that may require further treatment. Many patients will have residual abnormalities on standard imaging (CT or MRI) following treatment that has previously been difficult to define as residual active tumour, necrotic (dead) tumour/tissue or post-radiotherapy fibrosis and oedema. There is no doubt that before the evolution of improved imaging techniques like functional MRI and PET /CT there were a large number of patients that underwent unnecessary treatments based on anatomical information alone. There is now good evidence in head and neck cancer and in lung cancer that the use of post-treatment PET scanning to assess treatment response is not only an accurate predictor of outcome but has significantly reduced the rate of unnecessary salvage surgery offered to patients that have an anatomical abnormality which is composed of dead/dying tumour. Likewise in brain tumours, functional MRI and PET imaging may reduce the rate of unnecessary salvage surgery offered to patients, who appear to have disease progression on routine imaging, by more accurately delineating those with treatment related changes from those with true progression. This approach is being extended to other sites including lung cancer, gastrointestinal tumours and melanoma. These new approaches to the use of functional and targeted imaging will allow the evaluation of changing treatment regimens, including in clinical trials, to determine the most appropriate clinical programmes are offered to patients. Integration of such technologies into routine clinical practice remains a challenge as a result of difficulties providing access and limited expertise.